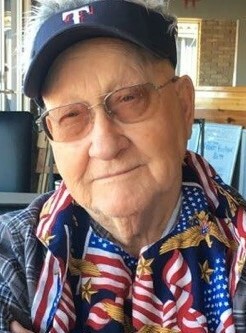 George Cornelius Wood, 87, of Quinlan went to be with his Lord and Savior on Monday, November 18, 2018 in Greenville. Funeral services celebrating George’s life will be held at 2:00 PM on Tuesday, November 27, 2018 at Ingram Funeral Home with Bro. David Hammond officiating. Interment will be immediately following services at IOOF Cemetery in Quinlan. Visitation will be one hour prior to the service. George was born on September 19, 1931 in Traverse City, Michigan. He was the son of the late Stanley William Wood and Lillian Helen Lardie Wood. He was raised and attended schools in Traverse City. He enlisted in the United States Air Force in 1950 in Traverse City and was honorably discharged in Fort Worth in 1954. While stationed at Sheppard Air Force Base in Wichita Falls he met a Texas girl Ferne Garretson and they were married on December 6, 1952 in Fort Worth. They were married sixty-four years at the time of Ferne’s death on April 3, 2016. George was also preceded in death by three sisters and two brothers. After graduating from SMU George went to work for Lennox Industries Inc. in Ft. Worth as an Industrial Engineer, where he worked for 42 years. After he retired they moved to West Tawakoni in 1980 where they owned and operated The Wood Shed for many years. George was a member and Deacon at Faith Baptist Church for many years and currently was a member of CrossPoint Baptist Church. After Ferne’s death George made a bucket list of things he wanted to do and was able to do two of them before his untimely death. George is loved and will be missed by his son Stanley Wood of Virginia; two brothers and one sister all of Traverse City, Michigan and numerous neighbors and friends.